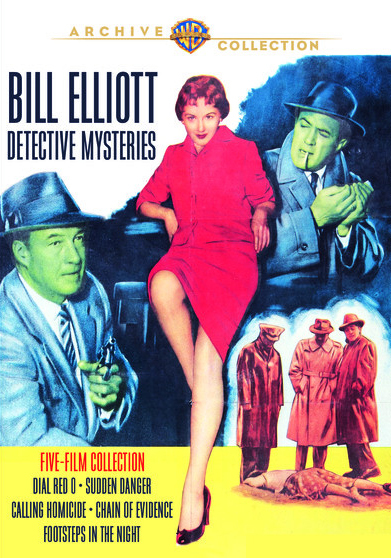 SUDDEN DANGER (1955) is another solid film in the Bill Elliott Detective Mysteries Collection, available from the Warner Archive. SUDDEN DANGER followed DIAL RED O (1955), which I reviewed earlier this month. This time around Det. Lt. Andy Doyle (Elliott) is investigating the apparent suicide of the mother of a blind man (Tom Drake). Andy quickly deduces it was murder, but whodunit? Her ostensibly loving son, who might have wanted her money for an eye surgery? His girlfriend (Beverly Garland)? Someone else? 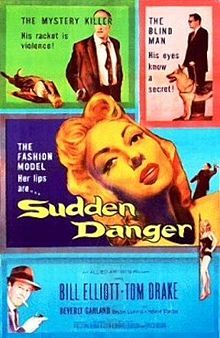 SUDDEN DANGER may not be great cinema, but it does exactly what a series movie should, provide enjoyable entertainment for around an hour -- 65 minutes, in this case. It's about on a par with a solid episode of DRAGNET. 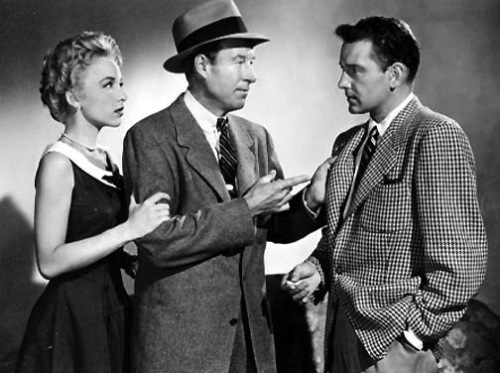 Reliable faces like Lyle Talbot and Frank Jenks turn up to move things along, and all in all, it's a fun story, by the reliable Daniel B. Ullman; Ullman cowrote the script with Elwood Ullman. Hubert Cornfield directed, with black and white cinematography by Ellsworth Fredricks. Like DIAL RED O, SUDDEN DANGER is a very nice print with no extras. It's great to have these movies available in such good condition from the Warner Archive. I'll be reviewing the three additional films in the set in the future. I enjoyed Sudden Danger - the first I've seen of these Bill Elliott films. It was well plotted and fast paced. Glad to hear you liked it, Vienna! If you enjoyed it you will probably like the others in the set as they are all of similar quality. I'm kind of sad I only have one left to watch as I write this!